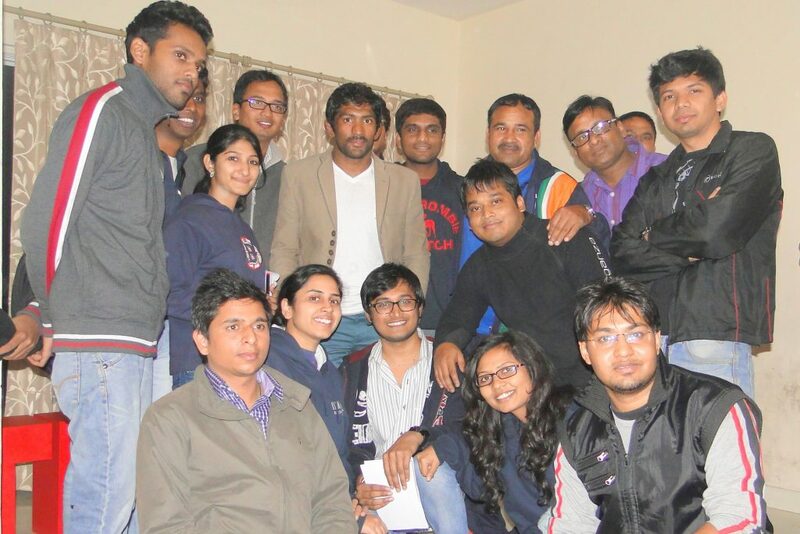 India’s champion wrestler, olympic bronze medalist, Yogeshwar Dutt visited IIM Ranchi hostel after his final bout at ‘All India Police Wrestling Championship’ and engaged in a lively interactive session with the students of the institute. Students bubbling with excitement, swarmed around him as he welcomed their questions while his coach, Anup Dahiya, complemented his answers. Yogeshwar’s humility was evident from his words. When asked about his inspiration, he humbly replied, “Any hardworking, determined person can become my inspiration. If you work hard, you can inspire me”. His coach shared anecdotes elaborating Yogeshwar’s dedication towards the sport and reinforced the philosophy of ‘No shortcuts to success’. “The feeling of success cannot be expressed in words!”, exclaimed Yogeshwar as he recalled his moment of victory at the 2012 Summer Olympics.When asked about his fitness mantra, Yogeshwar’s answer was simple, “Don’t drink. Don’t Smoke. Eat healthy”. He encouraged students to work towards their goals while keeping in mind that there are no substitutes for hard work and discipline. On his visit to the institute, he also promoted TEDx IIM Ranchi- A set of conferences designed to stimulate constructive dialogue between communities, organizations and individuals. The event is hosted in the spirit of ‘ideas worth spreading’-a mission which Yogeshwar believes in. With Yogeshwar Dutt and Sushil Kumar winning medals at International events, more and more youngsters have come to join the sport and are gearing up for various events. According to Anup Dahiya, India can expect more such victories in various wrestling championships in years to come.